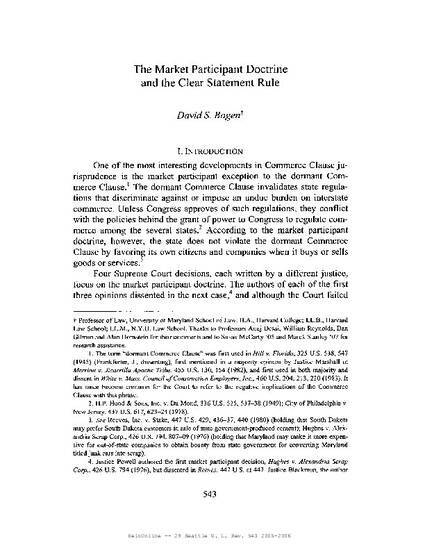 This paper argues that the market participant exception to the dormant commerce clause reflects the same concerns that led to the clear statement doctrine for application of general legislation to the operations of state governments. The genius of the Constitution was to make federal law directly applicable to individuals instead of through state governments – this made enforcement easier and avoided confrontation between the state and nation. Confrontation in which the federal authorities order the state to act in a particular way should be a result of consideration of the need to do so. But the dormant commerce clause by definition applies only when Congress has not acted and thus has not considered the matter. There is no basis to presume that Congress would forbid states from preferring their own citizens in internal operations where federal law must operate directly on the state and thus create a confrontation. However, where states attempt to control behavior by contractual provisions, federal invalidation of the contract provision will not necessarily invoke a confrontation with the state. Thus, the market participant exception is qualified by the concern for downstream regulation. 29 Seattle University Law Review 543 (2006).